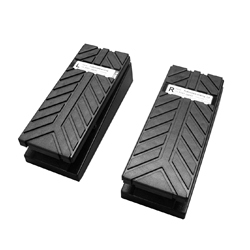 Large left and right analog foot pedals for use with specific tests requiring foot control. These foot pedals are used with the Universal Response Panel, model 64025. These analog foot pedals are an optional control input for specific tests, such as the Model 64055 SensoMotor Coordination Test. For more information about the Universal Response Panel and the SensoMotor Coordination test, view the ACCESSORIES tab.